Some products may state the percentage of an ingredient in brackets after the ingredient. This occurs when the ingredient characterises the product. For example, in an apple pie the amount of apple will be stated as a percentage of the product. All food products are required by law to display an ingredient list. 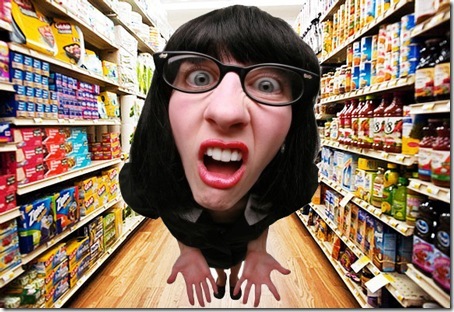 Beware of other names for fat, sugar and salt:. Fat: vegetable oil, butter, copha, cream, shortening, margarine, palm oil, sour cream, lard, animal fats, copha. Sugar: fructose, lactose, honey, sucrose, raw sugar, brown sugar, cane sugar, dextrose, glucose, golden syrup, maltodextrin. Salt: rock salt, vegetable salt, sodium chloride, sea salt, stock cubes, monosodium glutamate (MSG). 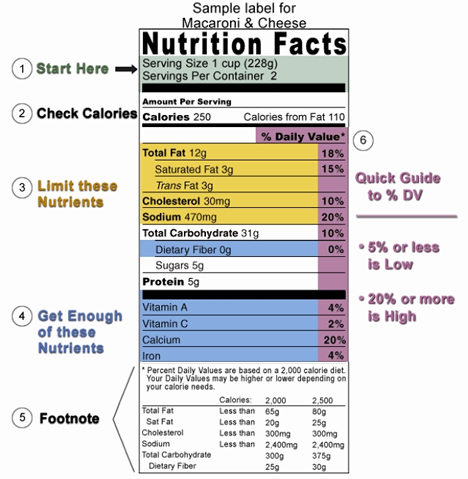 The information on a food label (sample nutrition label below), can vary with each food product; it contains product-specific information (serving size, calories, and nutrient information). The bottom part (see #5 on the sample label below) contains a footnote with Daily Values (DVs) for 2,000 and 2,500 calorie diets. This footnote provides recommended dietary information for important nutrients, including fats, sodium and fiber. The footnote is found only on larger packages and does not change from product to product. In the following Nutrition Facts label we have colored certain sections to help you focus on those areas that will be explained in detail. You will not see these colors on the food labels on products you purchase.